November 11 Update: The warm streak has continued into the first third of November. The monthly average through the 11th is 13.7°, which is 9.0° above normal. Only 2 days so far have been below average (-2° on the 3rd and 5th). The excessively warm temperatures were also reflected in the precipitation total which was 72% above normal. 9 PM Update: As of 2 pm local time, the daily high of 27° and low of 26° yield an average which is 17° above normal. This is now the 6th consecutive day with temperatures of at least 15° above normal. In mid-July, a certain high-traffic weather/climate blog was prematurely touting "Coldest July in history for Anchorage? ", and this claim was widely echoed in the climate deniosphere. As noted by Tamino at Open Mind and further discussed in the comments, the Question Mark ? was significant, since the final July average missed the record by over 1°F, putting 2012 in 7th place. 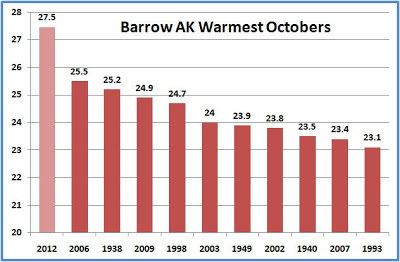 Needless to say, no correction was ever published for this misinformation by the perpetrators, and here's something else you're not likely to see from them: With 4 days left in the month, Barrow, on Alaska's Arctic coast is on track to smash its record for warmest October by an unprecedented margin. 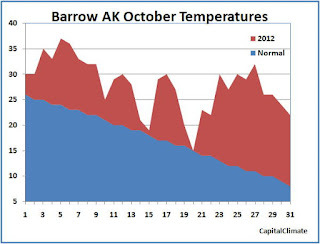 The National Climatic Data Center notes that "Barrow is the most northerly First-Order station operated by the National Weather Service." As such, it has a reliable temperature record extending back nearly a century, to 1920. The first 10 days of October started off as the warmest on record, and the warm streak has continued through the remainder of the month. In fact, the departures from normal have increased even further in the past week, reaching an astonishing 21° yesterday, the 27th. All of the past 5 days have been at least 15° above average. So far, every single day of October has averaged above normal except one which was equal, and the forecast indicates that will continue with double-digit departures through the end of the month. The monthly average temperature so far of 28.0° is currently 9.6° above average. Despite a cooling trend in the next several days, the forecast temperatures through the 31st indicate a final monthly average of 27.3°, or nearly 13° above the October normal of 14.6°. This would be 1.8° above the previous record in 2006, a margin greater than the difference between the current warmest October and the 7th warmest. 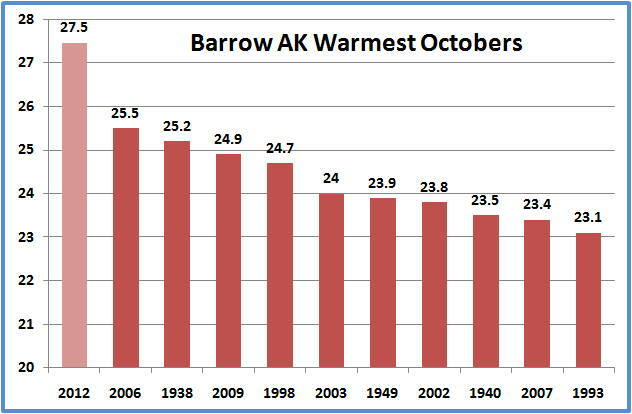 Note that 7 of the 10 warmest Octobers at Barrow have occurred in the years beginning in 1998. Daily high temperature records of 41° and 38° were set on the 5th and 6th. Highest minimum temperature records were set on 4 consecutive days from the 3rd through the 6th, when the temperature failed to go below freezing. Additional warm low records were set on the 23rd (28°) and the 27th (27°). Including 3 more high minimums set in 2011, 9 warmest lows have occurred in the past 2 years. By contrast, only one low minimum temperature record has been set at Barrow in the 13 years of this century. The extraordinary late-season warmth at Barrow reflects an area of above-normal air temperatures over the Arctic Ocean from north of Siberia eastward to the Beaufort Sea near Alaska, where temperatures have averaged as much as 14°C above normal. 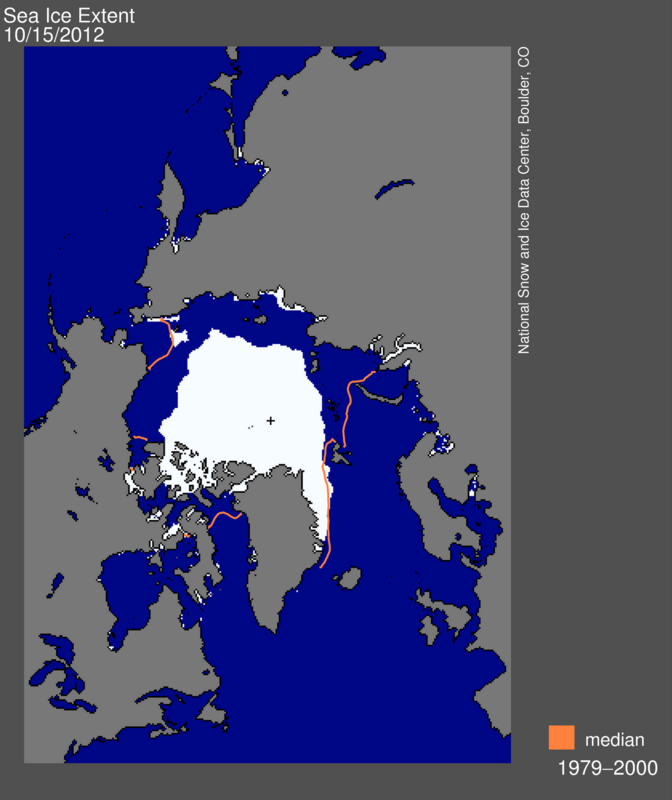 This extremely warm area corresponds closely with the wide area of open ocean remaining from the record-breaking Arctic ice melting season of 2012.